The place name of Mellor is often translated as Bare Hill or Brown Hill. It is impossible to be certain of its origins as place names have frequently been corrupted and re-interpreted over time, but this seems consistent with the description of the Mellor Landscape at the time of the Domesday Book, when as Ron Weston has explained to us, the Mellor hilltop did not form part of any of the surrounding Parishes. 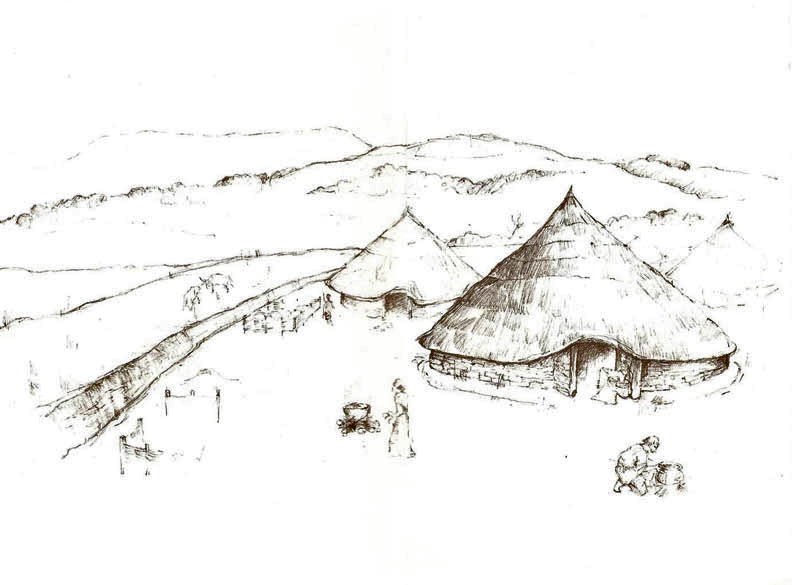 Another suggested interpretation however, which could relate to a far earlier time when the archaeological record tells us that the hilltop was an important trading or meeting centre, is that frequently used not too far away in the Welsh Marches. Maelor or Maelawr is a Welsh name often meaning simply "land, country or plain" but sometimes "market" from the word mael for profit or gain and the word lawr for land. A Welsh-English dictionary of 1803 (the Geiriadur Prifyscol Cymru) entry reads : "there are places so called in the marches of Wales..... where trade was carried on". (Morgan, Handbook of the origin of the place names in Wales etc, 1887). In an effort to pursue this area of research, Jonathan Day contacted the Institute for Name Studies to ask if they could clarify their translation of the place–name for Mellor. Their answer was that the translation is based on how it is written in the oldest texts they could find, but that they would take into consideration any formally published work showing an alternative translation. Jonathan raises the point that a CBA (Old Welsh) origin for the place–name is harder to justify from the physical evidence if none of the archaeological remains come from Wales. Those things that are not local either originated in the north or the east, not the west or south. The translation of “Bare Hill” is also possibly a little inconsistent with medieval descriptions of a hall in Mellor being on the edge of the King's Forest. He would aslo be delighted to hear from anyone who might have an explanation for how a Welsh name might become used for a non-Welsh hilltop settlement. With thanks to Jonathan Day and Barbara Lightfoot.